Terezín-Theresienstadt, 3 of 10, Children on the Way to Auschwitz (Kinder auf Wege nach Auschwitz). 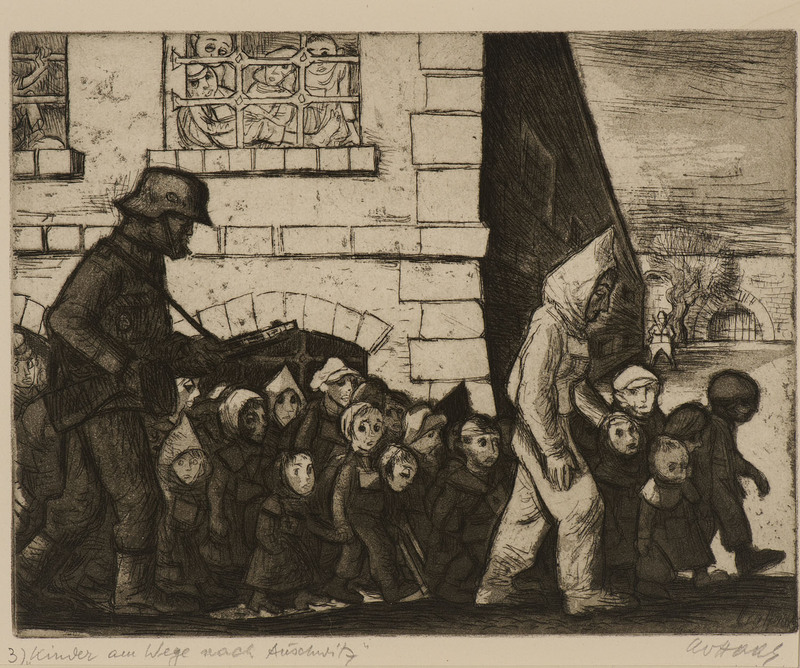 This powerful and haunting image, one of ten printed after the war using the original plate created during the Holocaust, depicts a scene in which children are led away by an armed guard and a hooded figure, whose faces are obscured and turned away from the viewer. In the background a mass of schematic faces press against barred windows. The contrast in light and deeply etched dark tones adds to the terrifying mood, the small stature of the children emphasised by the large scale of the two adult figures. Their features are hardly individualised, barely distinguished by gender, creating a sense of a generalised horror, even though Haas himself would have experienced these terrible and specific events on a daily basis. Ben Uri holds 10 works by Haas in the Collection. Yad Vashem in Jerusalem holds 21 portraits by the artist.